Most of us have heard the phrase, “the spirit is willing, but the flesh is weak,” while imagining such infirmity only befalls lesser souls. Every once in a while, though, even the most indomitable birder has to sit on the sidelines due to illness or injury, no matter how rare or plentiful the action is. Amazing birds have been flying through Rochester airspace, but a foot problem has kept me out of the field. What a drag! Despite my malady, I have been forced to drive far too much this weekend, which meant I could cross paths with a natty Northern Mockingbird, a sighting I always appreciate. 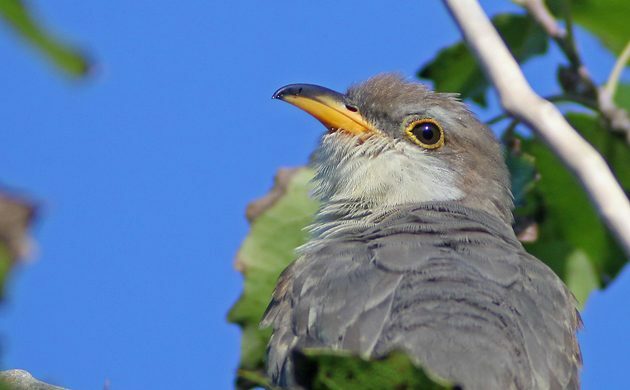 Corey had a hard decision between an amazingly cooperative pair of Yellow-billed Cuckoos or a stunningly non-secretive Sora for his Best Bird of the Weekend. He decided to go with the cuckoos, mostly because they were in better light. But it would be hard to argue against either as a choice for Best Bird of the Weekend! This is an easy one this week, with spotting a very rare, Chest-nut Sided Warbler at Hart mountain! Well the rarest was the drake American White-winged Scoter at Musselburgh but this was a returning bird from the Spring, Pectoral Sandpiper on the wader Scrapes there is worthy of mention but the best bird was Lothian’s third record of Woodchat Shrike, the first since 1967. A juvenile was found at Barns Ness on Sunday and was enjoyed by many local birders.